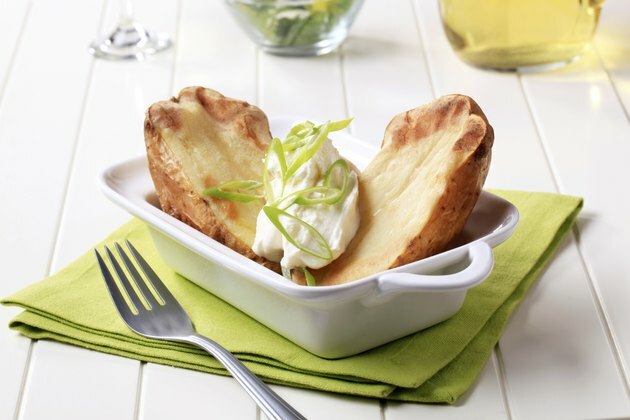 For meat and potatoes lovers, a meal may not be complete without a baked potato. If you're on a diet, you might like baked potatoes because they fill you up without providing a significant number of calories. You can include potatoes as part of a healthy diet; just take it easy on toppings as the traditional additions -- sour cream, cheese and butter -- add fat and calories. In addition to being a relatively low-calorie option for meals, baked potatoes serve up fiber and a variety of vitamins and minerals. 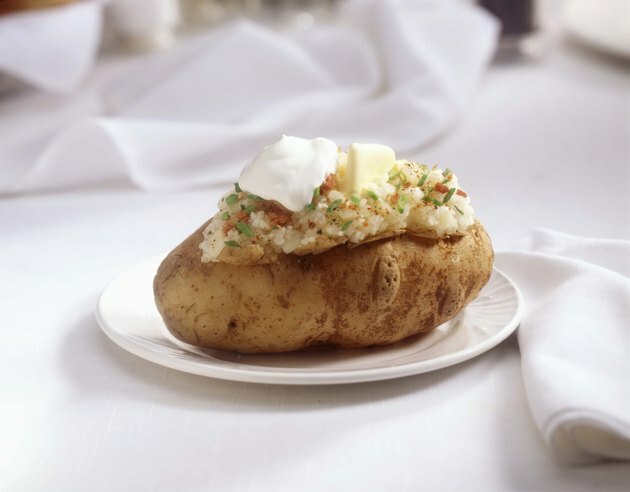 One large baked potato weighing 10.5 ounces has 278 calories, or 13.9 percent of the calories for the day if you adhere to a 2,000-calorie diet. You take in little fat in this serving size -- 0.3 grams -- making it a good option for low-fat diet plans. 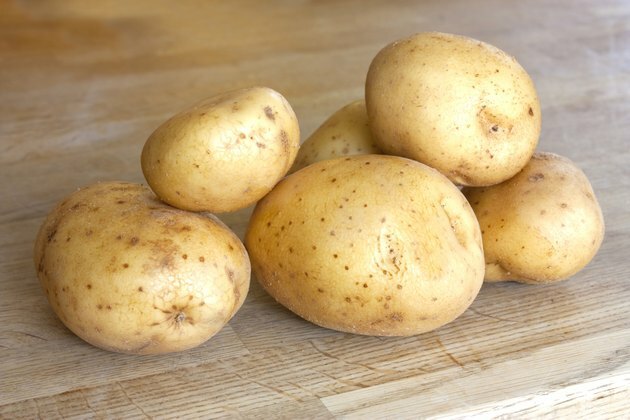 By contrast, a baked potato will not fit into a low-carbohydrate diet; each potato contains 63.2 grams of carbohydrates, a considerable portion of the 225 to 325 grams of carbs you need in your meal plan each day. Potatoes are also a good source of fiber. A large baked potato contains 6.6 grams, roughly one-fourth of the fiber you need daily. A baked potato also provides 7.4 grams of protein. Eat a baked potato, and you consume nearly 70 percent of the vitamin B-6 you should get each day. The vitamin B-6 in this dish influences the health of your brain, but a deficiency can negatively impact your nerves, skin and immune system, according to the National Institutes of Health Office of Dietary Supplements. Baked potatoes provide a range of other B vitamins as well, although in smaller amounts, including thiamin, riboflavin, niacin and folate. This dish contains 31.8 to 38.2 percent of the daily recommended intake of vitamin C.
Including a baked potato in your diet gives you magnesium and phosphorus. Each serving of this dish contains 21 to 31.1 percent of the magnesium and 29.8 percent of the phosphorus you need every day. It's also a good source of iron, with 17.7 to 40 percent of the daily recommended intake. 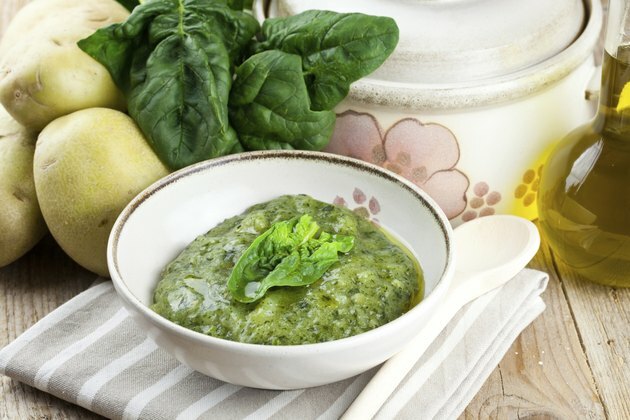 Women need more iron in their diets than men do, so consider topping a baked potato with spinach to increase your iron intake if you need a bit more. You'll take in small amounts of calcium, zinc and copper, too. 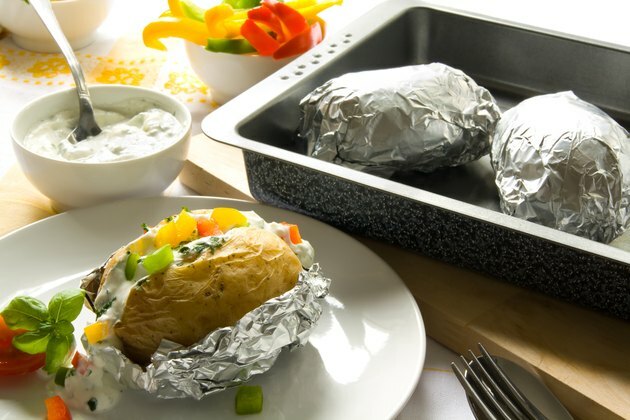 Baking potatoes in the oven usually involves wrapping them in aluminum foil, but this practice can result in the development of botulism if potatoes are not handled correctly. A report in the July 1998 issue of "The Journal of Infectious Diseases" notes a significant botulism outbreak occurred in the United States when people consumed potato-based dip made from infected potatoes. Botulism developed while these potatoes, covered in aluminum foil, were cooked and then held at room temperature for several days without refrigeration.